Barry Streakfries will make his triumphant return to the App Store next Thursday in Halfbrick’s Jetpack Joyride (previously known as ‘Machine Gun Jetpack’). I was fortunate enough to get some play time with an early build of this game at PAX East earlier this year and it was a lot of fun and have been eagerly awaiting its release ever since. At the time the game looked pretty much like a completed game, but it had grown much bigger and I’m excited that the wait is nearly over. The game was inspired by the machine gun jetpack (easily Barry’s most popular weapon of choice) from Halbrick’s endless runner Monster Dash. In the video below, Halfbrick’s Phil Larsen and Luke Muscat explain the reasoning behind the name change and the delay in getting the game out. Suffice to say, the name was changed due to the fact that Jetpack Joyride has evolved tremendously and will actually feature a variety of new and different packs for Barry to wear in addition to his signature machine gun jetpack. The new jetpacks include a rainbow jetpack, laser jetpack, bubble gun jetpack, steam jetpack and even a shark head jetpack. 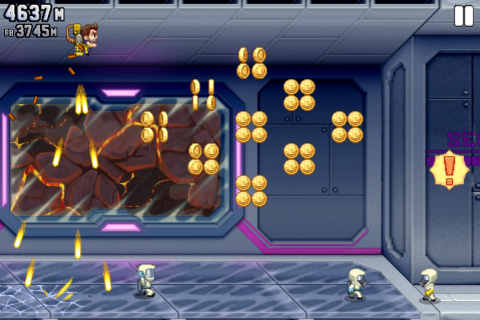 Jetpack Joyride features the same one-touch controls and simple addictive endless-runner style gameplay of Monster Dash, but with some awesome new elements. When this is released next Thursday (Sept. 1) AS A UNIVERSAL APP FOR ONLY 99¢ other titles better beware, because I predict this will be rocketing to the top of the charts. To create the best possible experience, there is special code within the game engine to make it look even better and smoother for iPhone 4 and iPad 2 users! This is definitely a MUST BUY day one app for me, how about you?